The most frequent question I get asked as a stylist is why am I experiencing hair loss? The average person loses 80 to 90 hairs per day. But if your hair is thinning or falling out at an unusual rate, there are many possible reasons why. The number one is male pattern baldness and it’s hereditary. Some women experience this as well. Another one is chemotherapy which causes major hair loss. Autoimmune diseases, under which there are several categories, also cause hair loss. This includes hypothyroidism and alopecia, both of which are both caused by autoimmune disease. Some medications can cause the side effect of hair loss. Pregnancy can cause hair loss. Most women experience some hair loss after giving birth. Physical stress is another factor. Dramatic weight loss and diet frequently cause hair loss as well as not getting enough protein and having too much vitamin A. The most common hair loss in children is caused by alopecia, anemia, cradle cap, and chemotherapy. Sometimes infants rub their hair while sleeping against a mattress or car seat. Fine baby hair may rub off. This is common and the hair will eventually grow back. Here are some easy ways to keep your hair looking and feeling healthier, avoid breakage and have less hair loss. Do not use rubber bands or wind too tight on the hair. There are specially coated bands or soft scrunchies that work better. When combing or brushing the hair be gentle and start at the bottom and work up to remove tangles. Hot tip – use the Wet Brush brand as it is much gentler on the hair. Also when using hot tools, flat and curling irons, it is important to use heat protecting products. By using hot tools without protecting the hair, over time it will cause breakage. Talk to your stylist about heat protective products that are right for your hair. There are hair products that plump and make the hair thicker. These are cosmetic only and wash out with every shampoo. 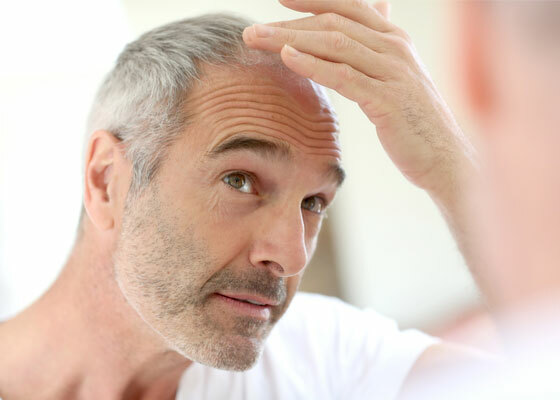 For people that are experiencing male pattern baldness, products such as Cerafill and Rogaine can be used as a treatment to promote the growth of new hair in the “dormant” phase. However, these products must be used daily for at least 3 months to see results and when you stop the results will end. There are also hair transplant options. Some women choose hair extension to make the hair appear thicker and fuller. If you think you are experiencing abnormal hair loss, speak with a knowledgeable hair stylist, your doctor or dermatologist.